‘Bob’ has made my day! Driving out to Cirencester with two hands gripping steering wheel to deal with the blustery winds buffeting my car I couldn’t help but wonder how the day was going to play out or even if the world was going to end due to the weird orange sky! But let me tell you the day panned out extremely well. From the window of our Cirencester office I could see people being blown along Dyer Street and felt dubious about heading out for some lunch and where we could go that we hadn’t already tried within a very close proximity to our building. 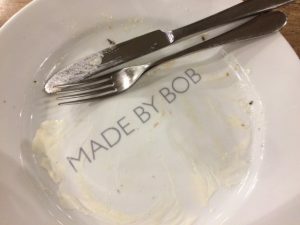 A client had recently been telling me her favourite place to eat was at Made by Bob and would you believe it this is one eaterie Ian hasn’t yet tried so off we trotted to see if we could get a table as apparently it’s really sensible to book. Fortunately we were quite easily accomodated and the incredible gastromatic aromas on entering the restaurant gave me high hopes for a decent lunch! I selected pan fried mackerel with parsley, capers and crème fraiche and Ian, feeling adventurous, chose Caponata with grilled focaccia, mozzarella, rocket and pesto. I’m not gonna lie, I had to look up Caponata not being sure if Ian was going to be tasting the delicacy of some poisonous fish, but as it turned out it is a Sicillian eggplant dish and apparently extremely tasty. The mackerel was a geneous fillet serving, with not one bone, this tasted incredible and I was feeling really pleased with myself that I had not only chosen a healthy managable portion option but that I had all the enjoyment of eating a really tasty fish without having to have prepared it myself or had to suffer the consequences when you cook fish at home and the lingering odour seems to remain in the house for a week! Then came my downfall – Ian suggested dessert (well I’m 80% sure it was him not me!) and with the main course being so delicious I couldn’t resist another look at the menu to see what was on offer. My head was in my hands when I spied a bread and butter pudding and boy was this a bread and butter pudding. Ian being a gentleman accompanied with dessert opting for a pana cotta. I cannot express too much how seriously good this food all was. Two spoonfuls in I knew I really needed to stop eating but the taste just kept pushing me to keep going and rendered me useless for the whole afternoon in need of a sleep and a pair of baggy trousers! By time we left, which was only 1.15pm, every table was full, there was a buzz of chatter, fantastic atmosphere and we had to squeeze through the queue of people waiting to be seated – so perhaps it’s a good idea to book after all!